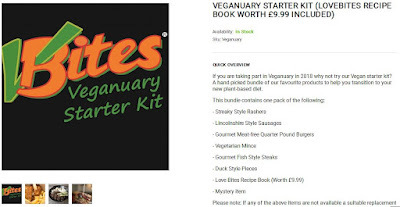 The Vegan Magpie: VBites Veganuary bundle! Hello! VBites have been offering a delicious Veganuary bundle for just £15.00! In this you get 8 items, including rashers, sausages, burgers, mince, fish style steaks, duck style pieces, a recipe book and a mystery item! I previously haven't posted about this as I felt the postage made it too expensive, but they have now announced FREE DELIVERY until 26th January!! Woohoo! This is on all orders over £15 (which is the minimum spend anyway so that works well).